Onstage is an artist’s studio, a space for invention and creativity that is full of surprises. Watch, and allow yourself to be charmed, as four dancers treat this fantastical space as a magical treasure chest, playing with everything they find: fabric, frames, paintings and props of all sorts. Inventive and curious, the dancers alter, reshape and transform the objects at hand in a game where there is only one rule – to have fun! Even the paintings spring to life, becoming enchanting dances that ebb and flow, driven by the whims of the performers. 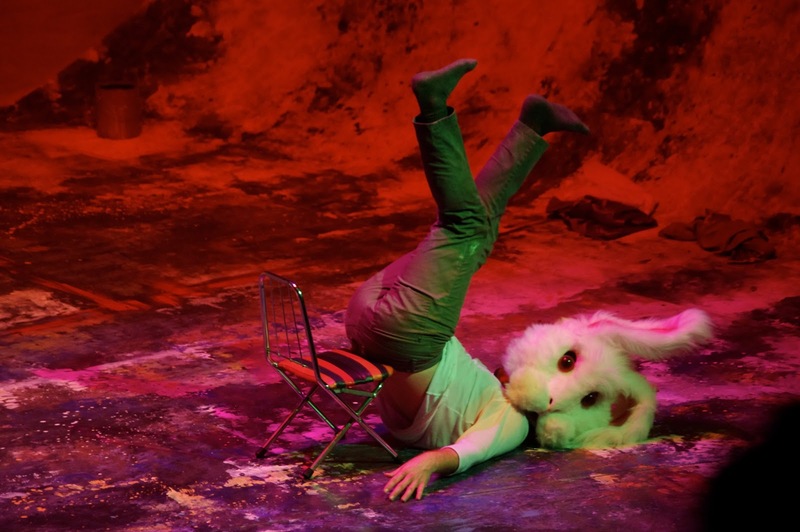 Revealing the creative spirit that lies in each of us, Bouge de là’s The Studio explores colour, line and movement to take audience members on a magical voyage into their own imaginations. Join Bouge de là on an amazing journey as they delight dance and visual arts lovers alike, at Horizon Stage on Saturday, March 16, at 2 p.m.
Bouge de là is one of the rare professional dance companies in Canada that is entirely dedicated to creating work for children and their families. 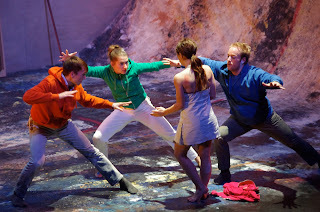 Founded in 2000, this contemporary dance company choreographs performances that draw upon a variety of elements, including video, theatre, and shadow play, to produce varied and playful performances that appeal to children’s curiosity and emotions, and stimulate their imaginations. 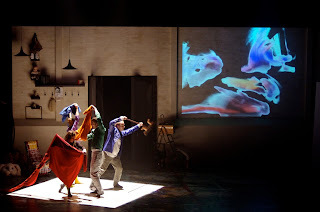 The company’s newest touring production, The Studio, is a flamboyant encounter between the visual and performing arts. 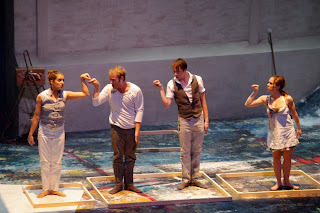 It features four energetic, curious dancers who plunge feet first into the act of creating art. As they play onstage their bodies move like painters brushes on canvas. Each movement is a line, a dab of paint, a shape, a colour and then presto, a painting takes shape before our eyes, cheerfully leading us down paths where art is accessible to one and all. Conceived as an artistic “blind date”, choreographer Hélène Langevin envisioned The Studio as a dialogue between two forms of artistic expression - engaging their differences and similarities. Sensitive to the lines, rhythm and space in painting and sculpture, she plunged into the art of the 20th century, its major themes, and the leading artists of the time. She was attracted to the work of Jean Dubuffet, Sonia Delaunay, Jackson Pollock and René Magritte, as well as Expressionism and Pop Art, and all served as a point of departure for the choreography and sets that were created for this production. The Studio is the third show in Horizon Stage’s 2013 Family Matinee Series. Horizon Stage is pleased to bring back this innovative and inspiring Canadian dance company after presenting their adventurous production, Like the 5 fingers on your hand, in 2008. Bring your children, grandchildren, nieces and nephews to see Bouge de là at Horizon Stage and let them discover new ideas, let their imaginations soar, their creativity be stimulated, and their appreciation for the world of art and all that it holds blossom. Tickets for The Studio at Horizon Stage in Spruce Grove on Saturday, March 16 are just $18 for adults, $15 for children and seniors. Curtain is at 2 p.m. and there are free craft and colouring pre-show activities in the lobby starting at 1 p.m. Tickets may be purchased at the City Hall Ticket Centre (315 Jespersen Ave), by phone at 780-962-8995, or online at www.ticketmaster.ca. Find out more about Bouge de là online at www.bougedela.org.